Sara Erenthal creates art from furniture left on the streets of NYC, upcycling TVs, bookcases, & tables left for trash on the curb. We followed her around to see her in action. 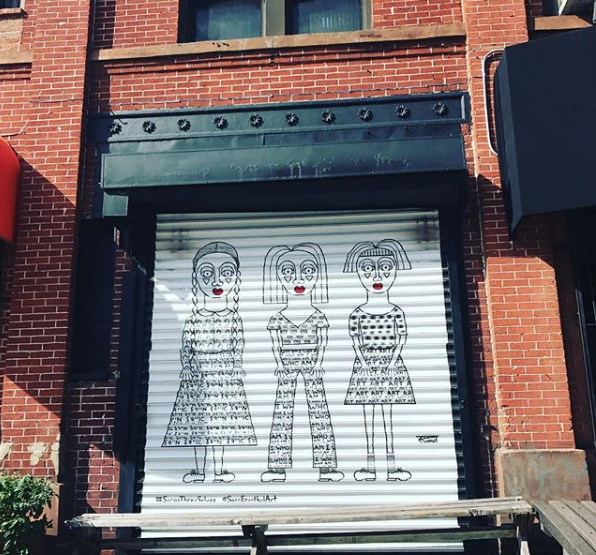 I first spotted Erenthal’s work a couple of years back on a roller door outside a yoga studio in Park Slope. The mural featured three girls in what I soon came to understand was her trademark style. On closer examination I noticed Yiddish text woven into one of the girls clothing. That caught my attention. Titled “Sara’s Three Selves,” the piece depicts three notable stages of her life; from her childhood growing up in a ultra-Orthodox charedi sect, through her journey of self-discovery, and ultimately to finding art as her calling (more on this later). It was an imposing, thought-provoking image. One that evoked so much emotion, depth and dimension, despite (or maybe because of) its striking simplicity. A quick search and “follow” on Instagram brought up Erenthal’s upcycled pieces. I was intrigued further and I soon started noticing more of these pieces popping up during my jaunts around Brooklyn. Aside from the portraits staring back at me, the text accompanying them always seemed to stop me in my tracks — almost as if she just knew what the viewer needed to see at that precise moment. I had to find out more about her process, so I tagged along with her one cold, blustery day earlier this winter to watch her in action and learn more about the inspiration behind her work. 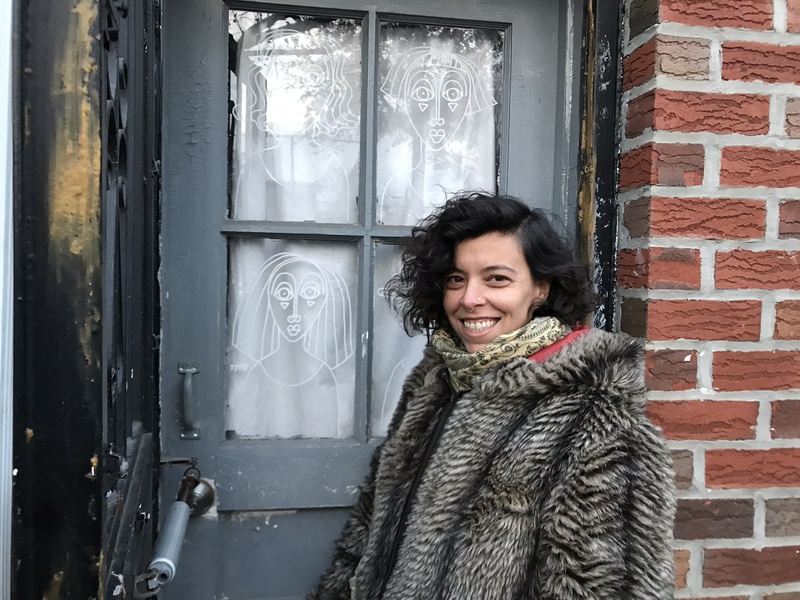 I meet her in her studio in Bushwick, a rapidly-gentrifying-but-still-quite-industrial part of Brooklyn that’s home to many artists. Armed with her materials (a handful of paint markers) we head out into the wind to scout for some pieces of trash to transform, a seemingly ridiculously easy venture in this city. We pass a group of tourists taking a tour of the street art that covers much of Bushwick's buildings. Murals 20-feet high, bursting with color, tower over sections of the neighborhood as part of The Bushwick Collective, a program to draw international street artists to the neighborhood. We talk as we walk, discussing how her “on-the-way-to-somewhere habit” evolved over the years. Seven years ago Erenthal was a 30-year old struggling artist who had just returned from a two-year backpacking trip around India. She'd been drawing and painting and sewing, and "just general creating" she tells me, her whole life, but it was during this trip that she developed a newfound love for art. There she committed to making it her full-time pursuit upon her return to New York. Now back in the city, and with little money for canvases and supplies, she would collect items she found on the street and bring it back to her studio to paint on. One day she saw an old window pane on the sidewalk that she really liked but couldn’t safely bring back to her studio. She drew on it, taped her business card to it, and left it there. Later, word got back to her that someone had picked it up and taken it home. “That window pane must have been sitting there awhile and no-one cared about it,” she mused, “And then it become art and it became more valuable. It just gave it new life.” This reframed her thinking. Now she started taking more notice of the garbage on the streets. 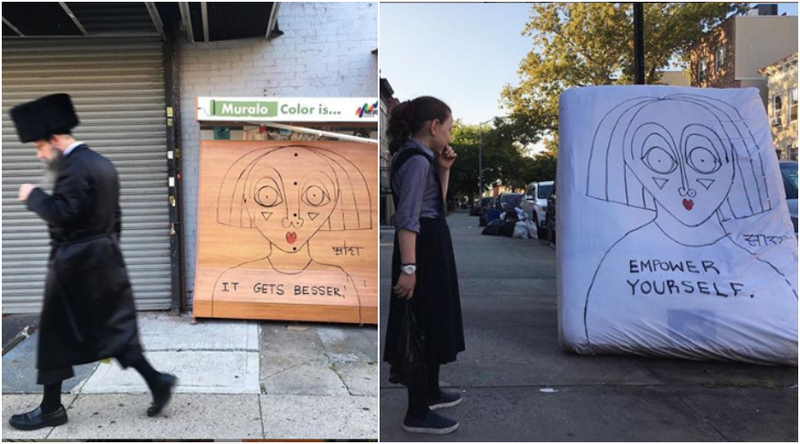 A mattress she noticed sitting on the sidewalk near her home for a few weeks, which she previously would have ignored, became her next canvas. A broken television set followed after. Soon text started accompanying her portraits. “At first it was totally spontaneous, but with time it became more intentional,” she told me. Now Erenthal, 37, has the city’s trash collection schedule memorized like an actor knows his lines. She knows precisely what days the bulk items are collected in the neighborhoods she frequents, and can bet on the quality of garbage in different areas. We come across a discarded plastic folding table leaning against the wire fence of an empty corner lot. Erenthal assesses if it will make for a good surface — not all trash is created equal after all. She signs it with her signature; her name in Sanskrit, that in a serendipitous twist of fate, also reads as “art” — something she picked up while in India. Asked if she wanted to share the meaning of the statement on this piece, she declined. “This one is private,” she said. Sometimes she’ll stick around and see if anyone collects her art. Before we move on she takes a photo of the piece and uploads it to Instagram. The transient nature of street art makes documenting her work an integral part of the process. “This is the only thing I’ll have left of something on the street,” she notes. It also lets fans know where they can potentially find one of her pieces. We continue down the road and around the corner, keeping our eyes peeled. “Trash used to background noise,” she smiles. Not anymore. We spot a mattress and she pauses for a moment as she considers what she’ll draw. She doesn’t need much time and soon puts marker to mattress. A face soon fills the queen-sized bed. Big hair, big eyes. Some passersby pause and take a peek at the artist at work, others — in true New York fashion — don’t skip a beat on their way, eyes glued down at their phones. “Dreaming of warmth” she sketches underneath which, I assume, can be interpreted in both a physical (did I mention it’s cold?) and metaphorical sense. For some this might seem like a stretch, a teenage faux rebellion in the form of a crew cut and color. But for Erenthal hair has become an unlikely expression of her freedom and empowerment. When she was 17-years old her parents returned to Israel and not long after attempted to set her up for marriage. A day before she was meant to meet her future husband she escaped her home and joined the Israeli army. She also cut her short, a symbol of her rebellion and newfound independence. She moved back to the U.S. after finishing her stint in the army and in the 20 years since she’s had every hairstyle possible, she tells me, at times allowing it to grow back — perhaps an indication of her moving on? 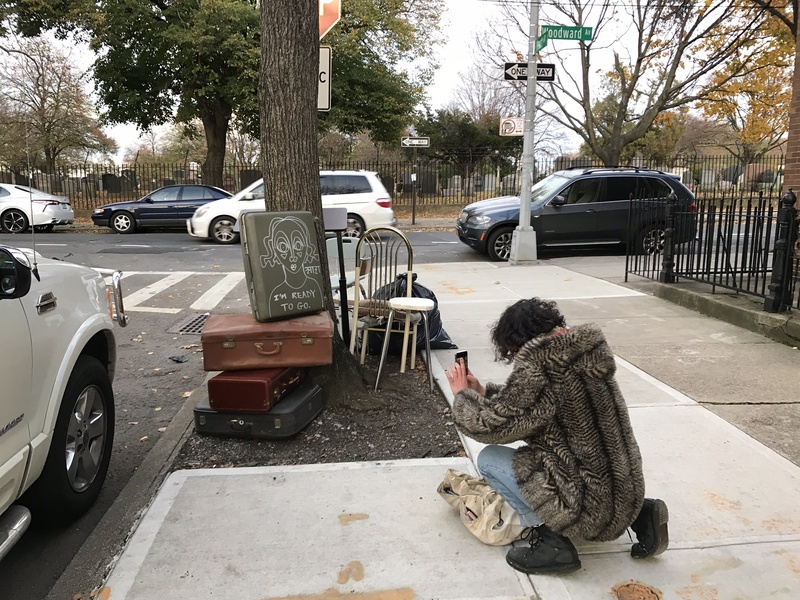 We move the down the street and find a stack of vintage suitcases standing against a tree trunk alongside an assortment of chairs, none that seem to be part of a set. “This must have been cleared out of someone’s house who just passed away,” she notes, gesturing at a handicapped shower chair. She stacks the suitcases and pulls out her marker. A white one this time. Also affected by the cold, it takes a few vigorous shakes to get the ink flowing. The sketch soon appears with “I’m ready to go” emblazoned underneath. Her favorite kind of art is art that makes her cry. She’s had a number of exhibitions and art shows over the last few years, including one in Tel Aviv last year as well as at the Jewish Museum in Montreal — that one a retrospective on her life journey thus far. She also led a community art education program for underprivileged children in Guatemala last summer, giving back where she can. In all her work — murals, wheat-pasting and upcycled, on the streets and in the studio — she brings a rawness and empathy that is almost right there for the viewer to tap into. It’s partially for her catharsis, but also to help others. 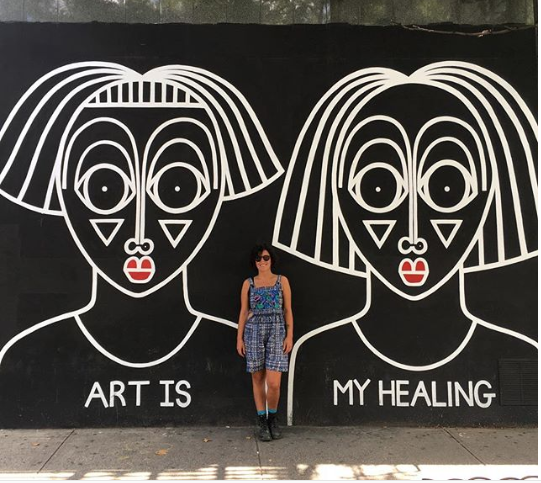 For her, personally, art has been such a pivotal part of that journey of healing and growth as she transitioned from her restricted charedi upbringing to a secular lifestyle cut off from the community she once knew. When she returned to New York as a 20-year old, she had to completely relearn the city she grew up in. She hopes her art brings a message of hope and empowerment to others. 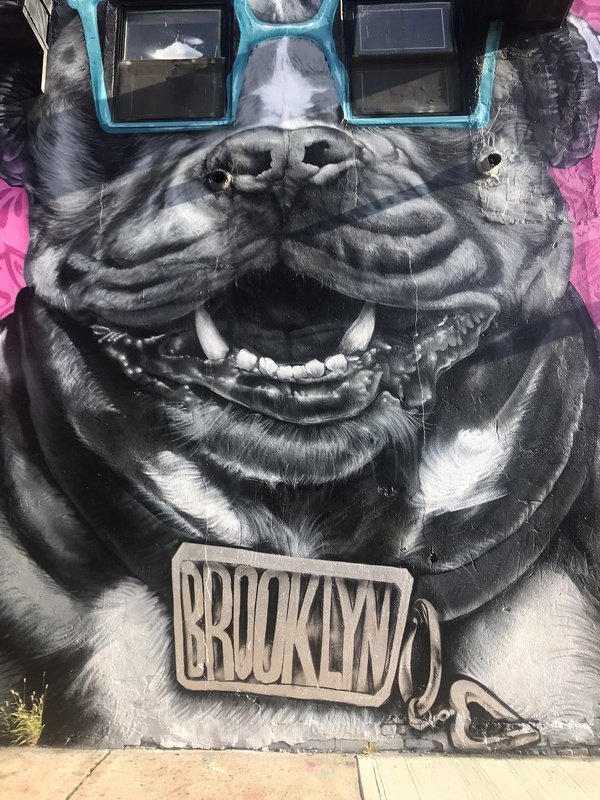 When I met her in Bushwick she showed me a stack of posters she was preparing to wheat-paste around her old neighborhood — a circuitous route back to Borough Park. “I have a voice,” “Empower yourself” and “Women are leaders” read some of them. A snow storm hit soon after which put a dampen on that particular venture, but she’s left a similar mark in chassidic Williamsburg and Jerusalem’s Meah Shearim neighborhood. “For me art is kind of what saved my life,” she said. “I’ve been through so much, and had a lot of struggle with finding myself and finding what I’m good at... Finding the way to let go of things from the past," she said. "Art gave me that. It gave me a way to express myself. To have that outlet really changed me and made me more whole with myself." In communities where women’s faces are hidden from public media, just drawing a sketch of a female face is an act of acute subversion. One portrait she drew on a window in Meah Shearim was smudged within hours of her drawing it, she recently told the hosts of an art podcast. Now she’s moved to a new neighborhood in Brooklyn so residents in Crown Heights can expect to see more of her upcycled pieces around. No doubt this neighborhood too, mostly populated by Chabad Chasidim and African-American residents, will benefit from her work.